During good weather one of the easiest ways to enjoy a good home-cooked meal is to use a barbeque grill. There are so many delicious recipes to try and almost all food items can be cooked using a grill. Northwest Propane is a professional company that makes propane gas grilling in Dallas convenient. We are happy to offer residential propane services that will meet your needs. 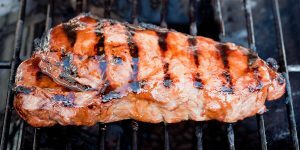 Whether you are a barbeque professional or novice, here are some benefits of propane grilling and tips for a successful barbeque. You might be surprised to learn that there are many benefits of propane grilling. First, propane grilling outdoors allows you to keep your home cooler and more comfortable during the hot summer months by not having to turn on your stove. Another benefit of propane grilling is that it typically costs less than charcoal grilling. Always use your propane gas grill in a well-ventilated area outside. You should not use your propane grill inside a garage or other enclosed area such as a balcony. Always ensure the grill controls are turned off and the cylinder valve is closed when it is not being used. Before using your grill, be sure to check for leaks using a special detection solution. Do not use a lighter or matches to check for leaks. If you have any additional questions about properly using and maintaining your propane tank, contact your Northwest Propane, your Dallas propane gas company, at 800-274-6121.